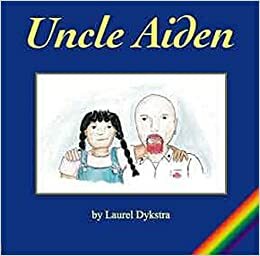 Uncle Aiden (2005), written and illustrated by Laurel Dykstra, might just be my favorite gay uncle book. And, there are probably as many gay uncle books as there are boys who wear dresses books, which is to say competition is fierce. The first-person narrative is relayed from the point-of-view Anna Maria Flannigan Cruz. She has a lot of aunts, uncles, and cousins, but red-haired and pierced Uncle Aiden is her favorite. He plays pirates and tea party. He introduces Anna Maria to all his boyfriends, and he takes her to Pride. He’s wise and willing to learn Spanish. Anna Maria wishes everyone could have an uncle like hers. It’s a fun book and very accessible to even the youngest readers. I appreciate the incorporation of cultural diversity, eschewal of gender stereotypes, and inclusion of polyamory. I like Anna Maria and Uncle Aiden, and I think you will too! But, it’s not easy to find so if you stumble upon a copy pick it up!